It's Friday. We made it through the first week back at school and work intact. Well done us! Thank you all for your lovely comments on Polly and Alfie, you are very kind. Alfie is getting a little bobbly due to over-cuddling and I fear I may have to sew an arm back on soon as he is dragged everywhere by his paw, but otherwise they're intact. Now I know New Year feels like an age ago already, but I wanted to do one of those posts where I gather together everything I made over a year and look at it. It interests me to see the changes in the kinds of things I want to make, my use of colour, the way crafting is less something the children and I do together, and more something I do for myself. A lot of my makes last year were for the home which is no surprise really, when you think that we moved house last year. Making is my way of putting my stamp on something. Also, there was a lot of crochet last year. I think that's partly down to my increased confidence with tackling harder patterns and wanting to push myself to try new things, but also because - now that my crafting time is largely limited to the evenings - it's much easier to crochet than hand-sew in electric light when you are tired. Likewise, projects that involve paintbrush or sewing machine are less appealing now that I'm at work, when I just want to sit on the sofa and pick up yarn and hook when I have any free time. Creatively, I'm not sure what 2016 holds yet. I have two blankets and one embroidery to finish, but when has an ongoing project ever stopped anyone from starting a new one? I'd like to make a blanket for Angus's bed. I'd like to cross stitch and embroider more. I'd like to paint more furniture and continue to work on the house. I keep saying I want to start an English Paper Piecing hexies quilt, and I have a huge stash of yarn scraps just sitting there...I just need to start it, and stop talking about starting it. But making things with my hands continues to make me ridiculously happy and I can't imagine a time in my life when I wont be sewing, crocheting or painting something. It calms me when I am anxious and soothes me when I am irritable or tired. But I also love the fizz of excitement at the start of a new project, and that exhilarating feeling of pulling off something I didn't know I could do, of learning to do something well. And the feeling of triumph and satisfaction at the end of a long project when you think, yes, it was all worth it, I'm glad I worked so hard on that. It's good for me. If you're interested, you can look back on previous crafty round-ups below. Lovely makes. I especially like your crochet stool covers. You can't buy lovely things like that can you? Well you can - but only if someone else makes them instead. No, that quality comes only from being properly and nicely handmade. We are lucky we can do that aren't we? I am drawn to the string bags in those photos, it's the colours I think. It's time I made one or two of my own I think. You certainly made rather a lot last year and all lovely. 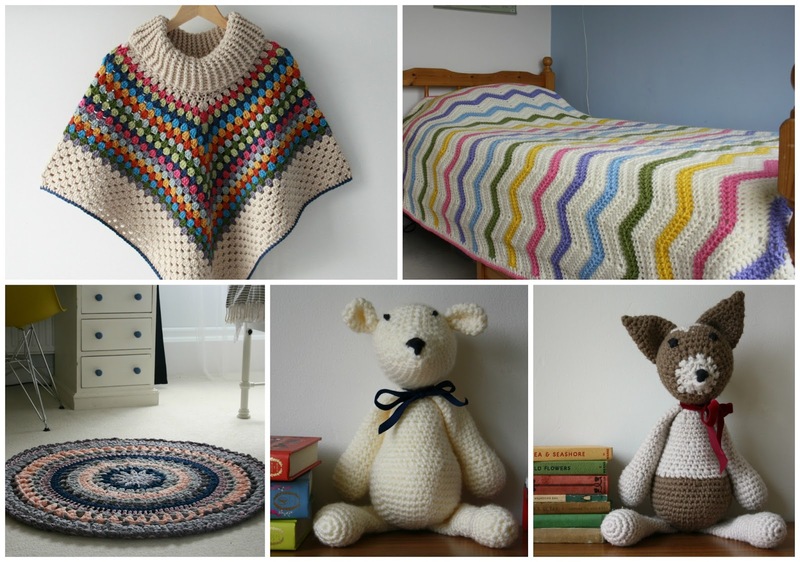 If mums make nice things, children continue to love what they make, no matter what age. A craft round-up is a great idea, a different way of looking back at the year. It's not just the things you made, but also you remember how you made them, what was your situation when you started, what it was like to work on it and return to the project in the evenings after work, who you made it for (when it wasn't something "general" for the house), and so on. You know what my favourite piece out of all these is? 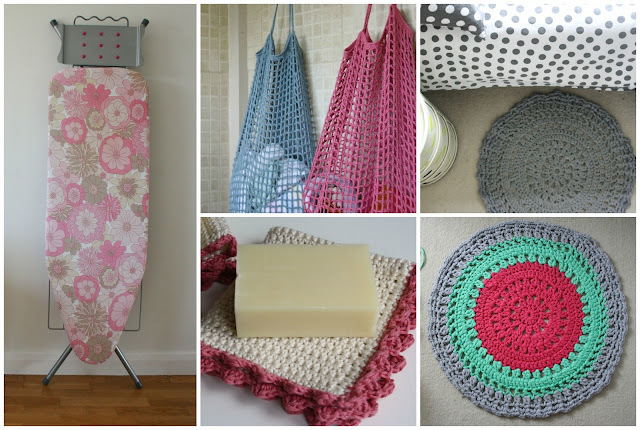 The ironing board cover! Your makes are full of colour and made with love for your home and family.Happy making in 2016 wherever it takes you. So many beautiful makes Gillian. I'm the same, I've knitted and cross stitched for years, and can feel myself beginning to get agitated if I have a day when I don't get chance to add a few stitches of some sort here and there. Look forward to seeing your makes of 2016! Beautiful makes! I crocheted a few string bags several years ago and they are so useful. I really love seeing blankets I've crocheted being used at others' houses, coming across a scarf hung on their hook or spotting a baby blanket on a friend's FB page. Crafting is such a good way to expres creativity and give comfort to loved ones isn't it? You made some beautiful things in 2015 and no doubt 2016 will bring us lots more of your creative crafting to inspire us all. 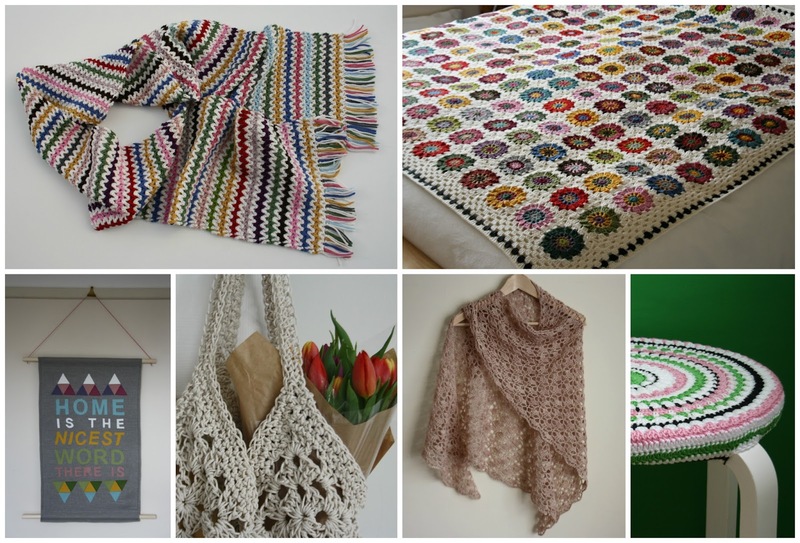 What a beautiful crafty collection!I keep looking at your South Bay shawlette - maybe 2016 is the year I'll actually make one. 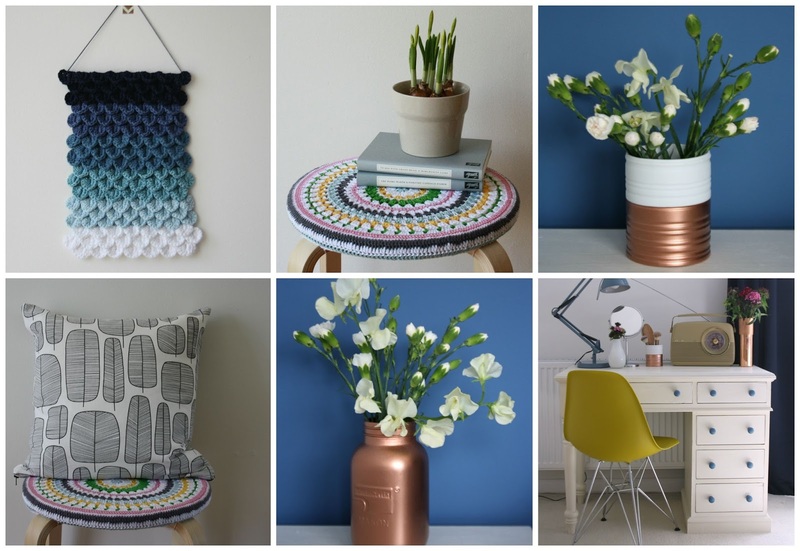 The thing I like best is your use of colour on the stool cover against the green wall in your hall. Ace ! Some really fabulous makes. Looking forward to seeing what you come up with this year! So many wonderful projects. Here is to a creative 2016! What a simply wonderful collection of your creativity this year! You always have such variety :) your ideas inspire my own...thank you so much for sharing!! God bless you in 2016!